The Karmaveer Puraskaar are National People's Awards for Citizen Social Justice and Action instituted by the citizens and people of India. These awards are instituted by iCONGO - Confederation of NGOs - a Public-Private-People partnership. For this recognition, Anupam said, "It's been a long journey for Shaadi.com and we continue to come to work everyday excited about building a platform that can correct the wrongs that occur in the name of marriage. 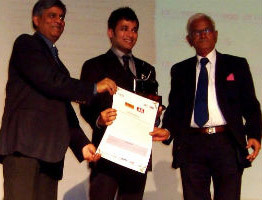 This award is a recognition of all the efforts of every Shaadi.com employee & I dedicate it to them. I also take this opportunity to rededicate the team to creating an even bigger social impact than we already have."